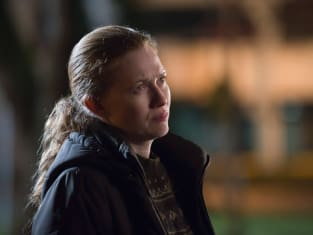 Don't get me wrong: The Killing, like plenty of shows, has had its share of flaws, including episodes that offer moments of boredom and aspects of melodrama that make you want to yawn. Except "Bulldog" was a perfect example of a biting force that gripped on with its story and characters and refused to let go. Perhaps it's because we're on the final stretch of the season, but I've seen plenty of programs waste away their remaining episodes for fluff and utter nonsense. This particular installment did none of that marking pretty much every moment with something rather significant and thoroughly absorbing. And in a way took things we might have predicted and spun them right around. Stan, a man with a violent past and caring heart, was able to prove his ability to go above being bossed around. Rather than kill someone to protect his family, he simply scared the man off. And surprise, surprise, Alexi was the guy to pull the trigger and finish of Janek. Stan is in the clear and I'm glad that he was able to stay above that particular path. I've a feeling that the Janek and mob story is through for the most part now. Did it seem easy to get rid of him right now, under these circumstances? Yes and it certainly wraps up that problem for Stan, but really it showed what type of man Stan is and how he was able to be resilient in the long run. Richmond broke down and gave his heartfelt speech that will either ruin him politically or turn his voters empathetic, but he too stood above the blackmail. I've wanted him to just reveal his story for the longest time and hope it works out in the long run. Billy Campbell really emoted the consternation that Richmond was feeling with each word and look in his eye. The man is putting it all out on the table. Richmond was able to overcome his reluctance and get past Mayor Adams demands. The characters on this show really have some dark backgrounds they have to deal with. Yet, with both of these characters dealing with their own inner demons so to speak, it was Linden and Holder's search for the key card that proved most exciting. Maybe it's watching the hero take down the bad guy or really sticking it to smug and arrogant people, but they've finally been able to find the proof that would blow the Larsen case wide open. 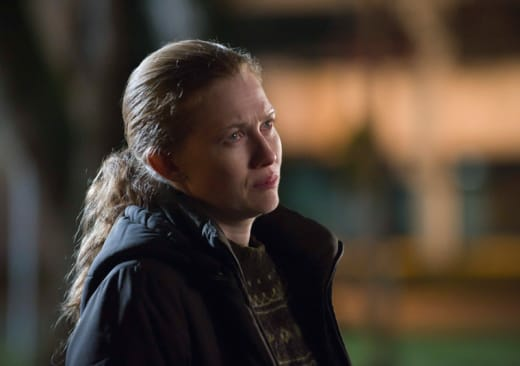 Certainly Chief Jackson deserved that type of defeat and I loved Holder slapping the warrant in her head of security's face and Linden holding the bloody keycard up the camera and giving a great big grin. I hope Jackson goes down in flames and she's shown how great an enemy she can be for this show, even if she's probably not the killer. But even, with their victory on the casino and dodging their own police brethren, it was the final reveal (which I was hoping we might get a peak at) of who the key card belonged to. Nope. It's not Mayor Adams. The card belongs to someone in Richmond's camp, most notably Gwen or Jamie. And while I didn't see that coming, I knew that the campaign was always connected to the murder and would eventually rear its important head again. It's just interesting knowing that its one of Richmond's loyal allies. There was something utterly exciting about watching Richmond's speech mixed in with Linden and Holder testing the keycard. We are just so close to the end, it's barely touching our outreaching finger tips. I'm curious to find out why Gwen or Jamie committed the horrible murder, if it is indeed one of them who did it. This was by far one of the best episodes of the season offering up an exciting and compelling drive towards the end and I'm eagerly awaiting for what the final episodes have to offer. If it can finish out as strong as this hour of television was, then I'll never want the rain to go away from this AMC series.